For many of us with an interest in hand-crafted textiles, we learn about the art and skill of weaving and embellishment by buying textiles that look interesting to us. If we’re lucky, we meet other textile lovers who are willing to share their knowledge, and we build our understanding and appreciation bit by bit, leading to a deep appreciation for the finished product, and the people who produce it. For a smaller number of us, we may find opportunities to meet the weavers and textile workers, and even to learn to create textiles ourselves. For a long time, I was in the position of having an interest, but not having a ready way to increase my knowledge and appreciation, but a move to India in 2006 gave me the exposure to a vibrant, exciting textile industry. During the years I lived in Bangalore, I got to see many beautiful examples of textiles from all over India, as well as meet people who were involved in the support of the handicraft industry, and the distribution of their lovely products. I even managed to visit a number of locations throughout India where the textiles are produced, and see first hand the lives behind the finished products. I learned much more about Indian textiles (accumulating quite a collection in the process – we need buyers as well as producers! ), and was able to take this knowledge and learn more about textiles in other parts of Asia during my travels. Now that I am no longer living in India with ready access to such a wealth of hand-crafted textile production, any opportunity to return is taken very seriously! Such was the case when my friend Chandra Jain in Bangalore was able to arrange a very special weaving course for me at the government weavers’ centre (BWSC). 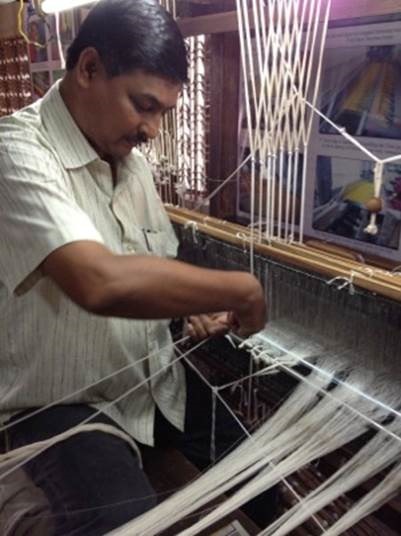 As you may already know, the Indian government has centres in many cities in India which are intended to support the workers in the handloom industry in all aspects of the trade, in order to keep the industry viable. 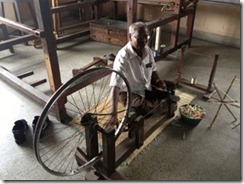 As such, they employ a number of people from traditional weaving, dyeing and hand-block-printing families, who are available to train, guide, problem-solve, and generally assist the traditional families in the handloom industry. As Chandra is so involved in supporting the handicrafts industry, she was able to get permission for me to do a basic weaving course at the Bangalore Weavers’ Service Centre. As a foreigner, especially with no skill to add to theirs, this was a very special opportunity for me. Although no formal course is offered by the Weavers’ Centre, my weaving training followed a structured approach, starting from the very basics, and was conducted by the head of the Weaving Section. His English is good, although we took a little time to get used to each other’s accents, and we managed to communicate well. The weavers in the centre work primarily on frame looms, although there is one small sample loom and some jacquard looms. 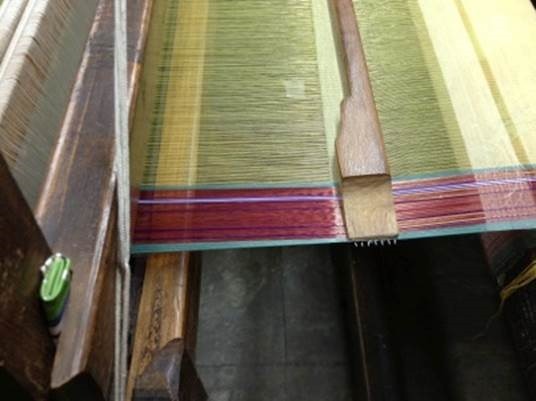 I was guided through a description of the parts of the loom, and the function of each part, in order to provide a basis for learning about the setup for and process of weaving. 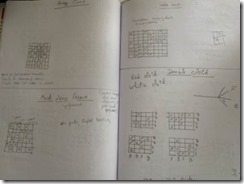 From there, I was taught the form of each weave, and its setup requirements. Since my teacher also has other responsibilities in the centre, I was left quite often with time on my hands. 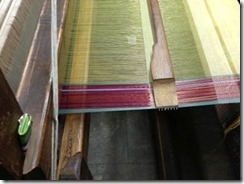 During these down times, I was able to watch the weavers working on their various tasks, and ask lots of questions. I think I learned as much of relevance to me during these times as during my formal lessons. Some basic information on threads and dyes was provided, mostly during ad hoc conversations about sample textiles brought to the centre. 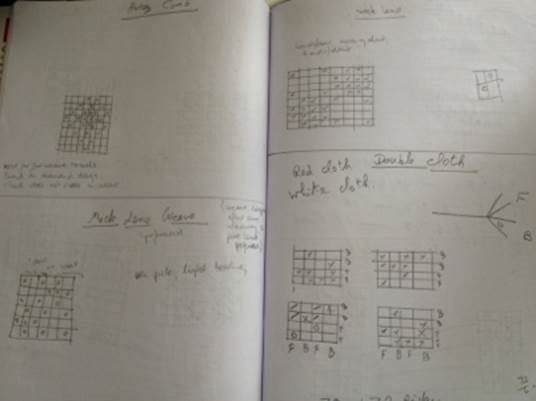 In addition, I was introduced to a costing model for textiles, and some problem-solving techniques. 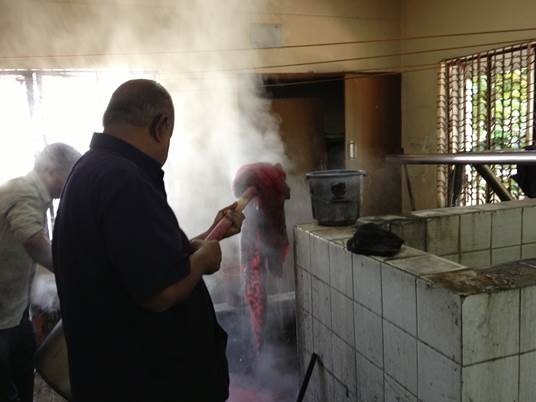 I also spent time with the dyers, and was able to learn about some of the problems encountered with dyes. All in all, a very thorough introduction to the handloom industry, and invaluable knowledge for future visits to markets and textile shops! 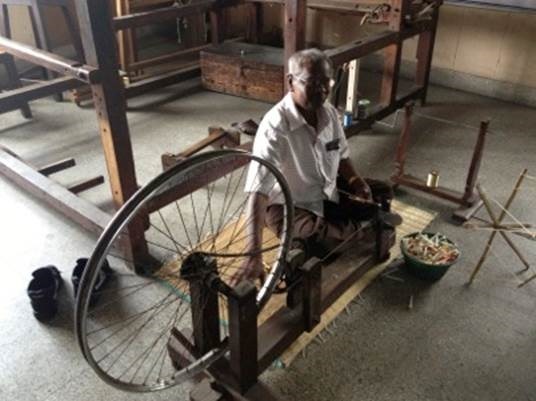 On the last few days of my course, I worked with the employees at the centre to prepare the thread on reels, and setup the sample loom, which I was then able to use to create my own piece of hand-loomed textile. During the time I worked with the BWSC staff, I came to hear more about their lives and their thoughts about the future for handloom. Increased competition in the form of cheap textiles from China, and the loss of the cheaper child labour has made it increasingly difficult for them to charge enough for their textiles to make a decent living. Although all the workers are from families who have worked in the industry for generations, and received their training at home within the family business, their children attend standard schools, and are not available for the time required to learn from their parents, or to participate in general production. All of them agree that the government requirement that the children go to school is good, and that the children stand a better chance of earning an decent living in the long run, but they recognise it as the end of their world. Another point that surprised me was how similar the skills required to be a good textile designer/master weaver are to IT skills. The structured thinking, precision, anticipatory skills, and problem-solving ability which make for good IT workers also form the basis for skilled, high-quality, efficient production of handloomed textiles. Since my career background is IT and manufacturing, it was easy for me to see how family characteristics that led to success in textile production can very easily be transferred to a successful career in the Indian IT world. It’s sad to think that the handloom industry is in such straits, and we can only hope that with focused attention from interested parties world wide that the market for handloomed textiles will grow and handloom will remain a viable option to make a living. 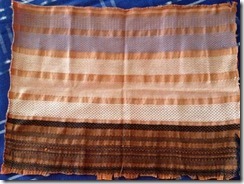 In retrospect, I realize that my biggest learning was not how to weave, but what goes into a piece of textile. The initial learning, the years of practice, the ideas and concepts of design, the day-in and day-out production. It’s a very hard life, with little financial reward – only the knowledge that you have created a functional piece of beauty which can be of great use to another person. It was a pleasure to watch and work with people who are so highly skilled. Yes, I would have to agree that weaving is a great basis for so many industries. Great article, thanks! 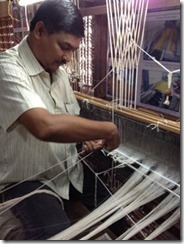 Hi, it’s nice to learn if your experience at the Bangalore Weavers’ Service Centre. I’m a writer and amateur artist. I have been crocheting and experimenting with yarns for a few years. Do check out my blog. Dhaga Bhaga (http://dhagabhaga.blogspot.in) I am still in the phase of getting better photographs done, so please excuse the work in progress quality. I would like to take my initiative to the next level by learning new techniques in fabric / textile design. It will be great if you could advise me on basic weaving courses or places where get hands on experience. Thanks a lot! Previous Previous post: The law court or the market? How should we share designs?